Could electronic medical records add costs? Electronic streamlining of medical records has been touted as a way to save money, against the backdrop of a health care system that is characterized as wasteful. Electronic medical records (or "Health IT") are supposed to save billions of dollars by eliminating duplicate or unnecessary testing. But a new study is saying just the opposite: Health IT may actually add cost to health care instead of curbing it. In fact, the study, just published in the journal Health Affairs, suggests that doctors who had electronic access to patient data were between 40-70% more likely to order tests. "It's a somewhat surprising finding," said Dr. Danny McCormick, assistant professor of medicine at Harvard Medical School, and study co-author. "Health IT is often put forward as a major solution to the cost crisis affecting the health care system. If it actually is not likely to decrease costs, we probably ought to know about that early on." McCormick and colleagues analyzed data from the 2008 National Ambulatory Medical Care Survey, which included 28,741 patient visits presided over by 1,187 physicians. To be included in the analysis, physicians needed the ability to order and receive patient radiological and lab tests electronically; and they had to be able to get back results of tests visually - meaning, if they ordered a CT scan of the abdomen, they could get back an image of that scan on their computer. The theory behind corralling a patient's medical records electronically – and being able to access previous data – is that it would, among other things, obviate unnecessary tests. But just the opposite happened in this study. Physicians who had electronic access ordered tests during 18% of visits, compared with physicians without access, who ordered 12.9% of the time. "What we think is may be going on is that like in a lot of spheres of human behavior, if you make something easy to do, people will do it more," said McCormick. "We saw a strong association between having the capacity to view an image and ordering more tests." One reason for the disconnect between this study's findings and those suggesting billions in savings, according to McCormick, is that those studies are based on successfully implemented electronic records systems at large health systems, such as Kaiser Permanente and the Mayo Clinic. But there are real-world considerations that don't translate the same way they do at those big institutions, according to McCormick. First, smaller practices may not be using technology as sophisticated as larger health systems. Another theory is that simply ordering up another test might be perceived as easier than taking time to review previous test results. "The effect may be to provide subtle encouragement to physicians to order more imaging studies," according to the study. A previous analysis by Harvard researchers, published in 2009 in the American Journal of Medicine, similarly suggests that, in general, hospital computing systems have not reduced overall costs. This most recent survey was not designed to answer more sophisticated questions, like whether the patient actually needed the test. 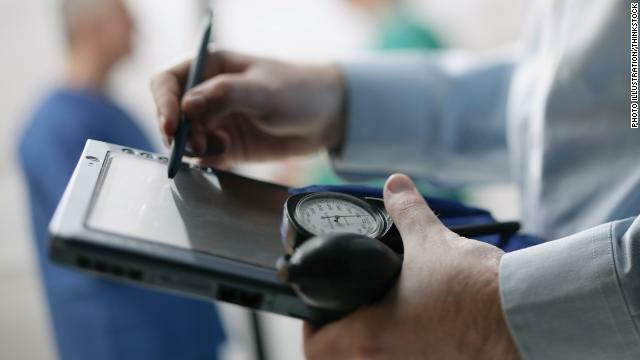 Or whether doctors who are savvy enough to install electronic medical records systems at their practices might also be more inclined toward ordering tests in borderline cases. To be sure, more study is needed. And that is the point, according to McCormick. "It really should give caution to those making the claim that Health IT is going to make a substantial dent in the cost crisis facing the health care system," said McCormick. In my experience, doctors order the same test a second time because they either don't trust what the previous doctor concluded with that same test or they think a lab tech didn't process results correctly. The medical industry is a rip off, the drs over charge for everything. Continued : of their patients electronically and must wait for hard copies via mail. Although the cost to standardize systems would be astronomical, pay off in the long term would save insurance companies billions. its a matter of them being able to easily acquire and evaluate the results of the tests. if something is easy to do and makes you alot of money then basic logic would be to repeat the process. doctors make money off of every test they order. faster test results in turn translates to more money they make in a shorter time frame. its not about helping people anymore, its about money. the reason most people go into the medical field is due to job security and the substantial annual income. there will always be a need for medical treatment and since high demand will always exist the price of these services will only increase and in turn will attract more money hungry personnel to order unnecessary tests and procedures. You are sadly misinformed. A growing number of doctors and health care providers are now salaried and recieve absolutely NO finacial incentive to order costly tests for their patients. If anything, over testing is a result of defensive medicine. I think that Dr. Brailer, the former national coordinator for health it, summed it up best when he said that he was unconvinced by the study’s conclusions because they were based on a correlation in the data and were not the result of a controlled test. Although this research is interesting, I find it more dangerous than helpful. Frankly, it might be true (although very unlikely) that digital records don't cut health costs, but this research comes nowhere close to proving this. A major problem with electronic medical records that I have NEVER seen discussed is the persistence of errors in the medical record. I obtained my family's medical records from the University of Michigan's medical records system in order to apply for insurance and found errors ranging from harmless (a statement that my son plays football–not true– and that we live in a town I've never even visitedt) to potentially serious–a statement that my sister has high cholesterol (I have no sister! ), and inaccurate weight record so it looked as if it had changed drastically, and an inaccurate list of medications including two I had never heard of. I could go on, but you get the idea. It turned out to be impossible to actually correct the record. The best that could be done was an inserted "emendation" which recorded my objections to the inaccuracies, and it took time and effort to get even that done, and probably makes me look like an unreasonable patient. Given how hard it can be to get medical insurance, all of this can have both medical and financial implications for patients. IIf we move to permanent, life-long electronic records, then patients should be given the opportunity to "sign off" on what the doctor records and point to needed changes before it becomes part of the permanent medical record. Maybe you gave them that information I have never heard of such a large amount of mistakes, if it is true go back and correct it with them DUH! Our Healtrh Clinic ofice is utilizing EHR and have been away from paper charts since 2006. Biggest obstacle to keeping all systems up to date and running is a MAJOR cost. Also, they are pushing us to exchange data with hospitals and other providers and want to charge thousands of dollars to connect to this Health Exchange system. It's very expensive for our small office to keep current technology up to date. Coments are correct that EHR systems are not compatible, there is no standardization and hard to pull correct and accurate data for reporting. It's gotten better over the last few years but remeber, the medical industry is WAY behind in the technology areana and will take years to standardize and link all EHR's together to share the pateints health info, till that happens, cost for additional tests and inacurate diagnoses will continue. EHR is like a Mercedes that doesnt run.. Looks beautiful and smooth running and the price is astronomical..but will continue sitting hitting the wallet... but hey it looks good. Another issue is information overload. The test was done, an interpretation was entered, a doctor made a sound judgement based on that information, but in the 3 months since the last visit, there have been 200 or so other entries into the chart, telephone notes, consultant reports, insurance card scans, preauth notes, other visits to outside facilities, etc. The important information gets buried in the mire of all the other information that has already been acted upon. Reordering the test is the simplest way to get that information "above" the quagmire so that you dont have to spend 2 hours parsing through every record in the chart, 98% of which is non-physician entries. When one is hired to do a report and the answers are supplied with the original reference material then this is what you get, a useless report. I am convinced that electronic health records are the way to go. If the record is organized correctly the lab reports are all in one place. The Dr. can see what the reports say for months and years in just a couple of minutes. If done correctly, no pages are lost like they used to be with paper records. Pas can be quickly printed out if needed for some Dr. not in the system or if you just want to keep your own record. One has to look at who is supporting or pushing for Electronic Health Care Records: The companies that make them, those that consult or service EHR, politicians that are looking for an easy fix to the health care problem, certain doctors that go around giving lectures on the benefits of EHR (wonder why those docs are giving lectures and not practicing medicine) and insurance companies that can easily data mine records for ways to deny coverage. I recently talked with a doc who is part of a 6 doc practice who paid $240,000 for his system. It would have been $200,000 but at the last minute, they realized that since one of the two offices was located in a different state, an additional $40,000 was added. This doesn't include extra hours of time and lost productivity due to decreased patient load to accomodate the system. EHR is a big scam. If a reader ever gets a chance, look at several patient's EHR. There are pages and pages of useless and often too similar information. I agree that insurance companies are in favor or EMR's, but it's not in order to deny coverage. It is so that they can process and pay for fewer unnecessary services. Health insurance charges a premium that should cover the average expected costs of members' services, but if many members get more services than necessary, the premium would need to be higher to cover those average projected costs. Most health insurance companies have entire teams of doctors and nurses that manage health costs by working with people who stay in the hospital longer than is typical for a given procedure; or who end up in a high cost facility for something very minor, but could easily be transferred to a lower cost facility; or who test positive for a given condition but have not received services to help it (for example, if you tested with high blook sugar, a nurse might call and ask if you've talked about managing your diabetes with your doctor). All of the easy record access has to do with cost management, not denying coverage. Both parties win if costs are kept down – the insurance company, which does not want to pay for unnecessary services and wants to apply preventative medicine to avoid future more expensive procedures, and the individual, who usually would also pay some copay or coinsurance % on the extra services they receive or the future diseases they develop. Yes i dont think emrs add to patient costs, a lot of doctors follow standard procedures. A test is a subjective matter, emr does compile the patient demographic together but that in its self is not the trigger point. Either way, the whole point of the government backing EMR projects was to improve patient care. We have been able to assist alot of patients much better because of our emr (curemd smart cloud) and the features like clinical summaries and drug inter-checks have been a significant help!